Social service agencies will be able to help those in need more speedily when they start sharing a national database of information on all aid recipients from mid-2015. Those seeking help will be spared having to provide detailed information, such as the problems they face and what kind of help they previously received, each time they go to a different agency. For a start, Family Service Centres (FSCs) and Social Service Offices (SSOs) - often the first stops for residents seeking help - will be able to access the database. There are seven SSOs in various housing estates which act as the first point of contact for those who need financial help. The 43 FSCs islandwide help residents with family problems and provide counselling services. Other agencies, such as voluntary welfare organisations, will be brought into the system progressively. With a common database, social workers will have less paperwork to do and can devote more time to serving residents. It will also help the Government in its future planning as it can use the data to spot emerging social trends and problems, said Minister for Social and Family Development Chan Chun Sing, who announced details about the database yesterday. The Government has called for a tender to develop the national case management and information system, called the Social Service Net. 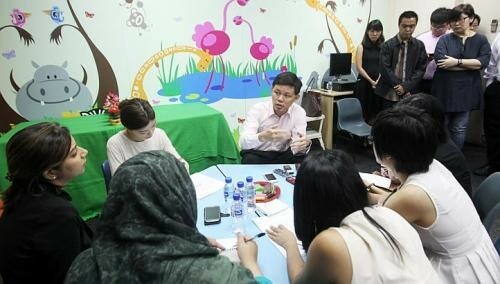 Mr Chan, who spoke to reporters during a visit to Kampong Kapor FSC, said: "The Social Service Net can significantly improve the delivery of social services through data sharing among service providers, much like what we are trying to achieve with the national electronic health record system." The national health record system allows hospitals and polyclinics to share information on patients. The first phase was rolled out in July 2011. Currently, social service agencies can tap a shared database that keeps records of those applying to the national ComCare help scheme. But it stores only basic information, such as the kind of help schemes that the residents are on. Detailed information such as issues that residents raise during discussions and counselling sessions with social workers are kept in hard-copy case files at some centres. The upcoming database will have all this information. Retiree Wee Cheow Thow, 68, said the new system would simplify the process of getting help. Mr Wee, who lives alone in a one-room rental flat, had previously applied for financial aid at a grassroots agency before he was referred to the SSO in Jalan Besar. "Giving information and documents to the staff again was quite troublesome then," he said. Residents can decide whether they want their details to be included in the database, and there will be measures in place to safeguard the information. Kampong Kapor FSC executive director Jessica Chan said that instead of relying on anecdotal feedback, the consolidated data in the new system could help her better identify, say, the top three problems faced by beneficiaries. Her centre could then organise programmes to better meet their needs. Ms Charis Kuang, centre manager at Care Corner FSC (Woodlands), said: "When families get into crises, they need help fast, but we may take quite a long time to retrieve all the information and documents, and send them to another agency." She added: "The new system will save us time and we can give due attention to families who need the face-to-face interaction with us."